Beloved may be the only horror novel to win a Pulitzer Prize. And it is a horror novel, in my opinion. It makes use of the tropes supernatural gothic fiction (in this case, a vengeful ghost) to examine the dehumanizing effects of America’s great sin, the Peculiar Institution of slavery. 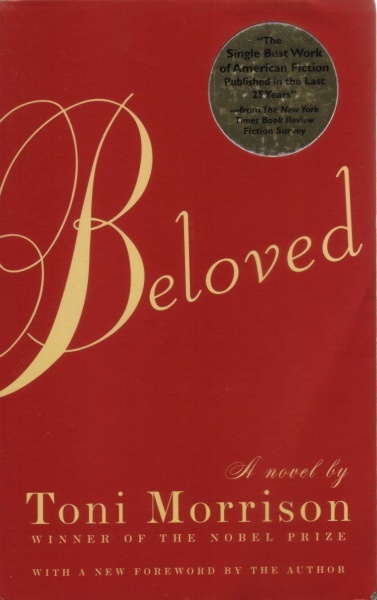 Beloved is, of course, also a historical novel that takes as its jumping off point a historical footnote about an escaped female slave who murdered her own child rather than have her be raised in slavery. But Beloved, the spirit of the murdered infant come back as a young woman forms the bulk of the novel. Sethe (perhaps her name alludes to Lethe, the Greek river of forgetting) has escaped with her four children from Sweet Home, a hellish plantation where slaves are routinely tortured. When the foreman, the sinisterly named Schoolteacher, finds her in Ohio (a slave-free state), he witnesses her slitting the throat of her unnamed infant daughter. He declares her a wild animal and not fit for slave service. The murdered child becomes a poltergeist, driving away both her sons after a few years with her wild antics. When a fellow escaped slave, Paul D, arrives at Sethe’s house, the ghost child is temporary banished. Beloved comes back in corporeal form, as a young woman. Forget Samara (the video ghost girl of the Ringu trilogy) or the possessed Regan McNeil (The Exorcist) or even telekinetic terror Carrie White. Beloved could have them for a light lunch. Because Beloved is a cipher, and her agenda is never clear. She is endlessly hungry, for Sethe, for love, for experience, for sweets. Does she want to possess Sethe—both figuratively and literarly? Or does she want to destroy her? Beloved is every wrong thing about slavery and racism given form, and she will do anything—to fill her endless, aching and damaged need. Beloved is beautiful, seductive, perverse and brutal. Morrison’s Faulkner language quivers and fractures in her attempt to capture the essence of this spirit. The imagery she uses is violent and disturbing—light, blood, sugar are invoked. Because Beloved has a strong historical subtext, its horror is even more powerful. Thanks, this was very good. I’ve read Beloved twice, and each time I wasn’t sure it was equal to its reputation. But this makes me think I had better give it a third try. Yes! I’m glad you’ve written about Beloved as horror. At Clarion when an instructor asked us to write on the board what one of our favorite SF/F/H works was, I wrote Beloved because I found it to contain some of the ultimate horrors, let alone employing horror tropes to examine them, too.